I should have known something was up with that type of heat in early June. Looks like this summer season will pass 2010 as 4th all time record high temperature for the period June/July/Aug summer season by almost .25 degrees per day. Last season 81.7, this year 81.93. Three more days this week of over 90 will give us 64 for the season which is one less than last year with the whole month of September still to come. A very heavy 1.10" of rain on July 12 was our last major daily rainfall. We've had an additional .69"(only .15" coming in one day) of rain in the last 39 days. Our weather station measures Evapotranspiration (ET) which is the amount of water lost from the surface of the ground which would be available for plants to utilize. Some of the factors affecting this loss include temperature, humidity, and air movement. Since July 12, we've had rainfall of 1.79" and an ET of 8.02". That is a very significant deficit which points to why our water usage has gone sky high over last 6 weeks. 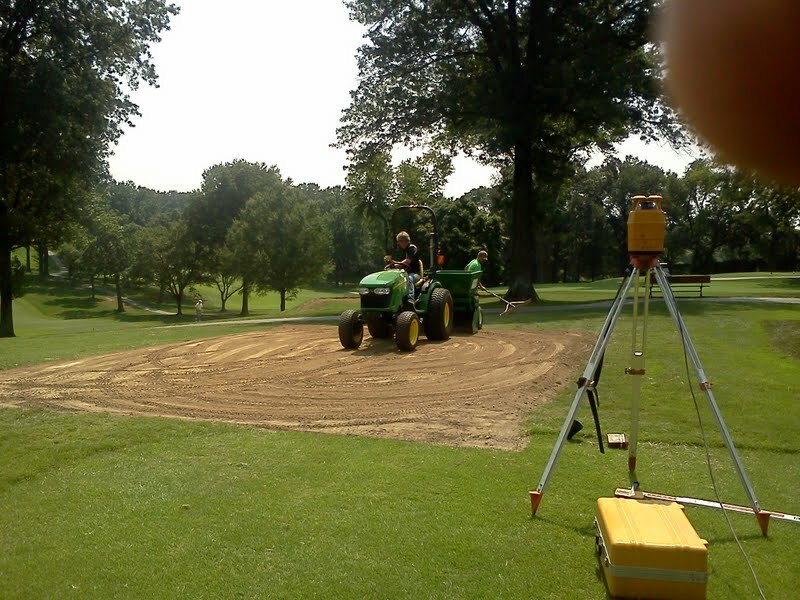 Check out Superintendent Frank Tichenor's blog at Forest Hill Field Club in Bloomfield, New Jersey. He has some photos from damage they received from Irene. By the way, Frank has an excellent blog as well. Why are some areas on the course brown? Another post that did not show up from my phone last week. The summer heat of July and August gave us some of the hottest temperatures ever and also left us with only 4/10" of rain since July 12. Our irrigation lake is recharged by runoff from rain but when there is no rain, city water is used. We used almost 8 million gallons of city water during the last billing cycle between July 15-August 1l and the meter continues to keep piling on during the current cycle. We are keeping our main play areas watered sufficiently but are throwing smaller amounts in our deeper rough and non-essential areas. The picture I've attached is behind 17 green and in front of 16 tee. Even with a modern irrigation system, you can still see how inefficient an irrigation system is in comparison to mother nature. There are numerous areas on the course in which weaknesses are on display from our system. A few tees, fairways and even greens are showing signs of damage from inefficient irrigation applications. I think its time for a rain dance. Maybe that will be a part of our Labor Day festivities this weekend. Old zoysia nursery between 17 green, 2 fairway and 16 tee. We have kept the irrigation off in this area except for the bentgrass collar nursery near 16 tee in an effort to conserve on our water usage which is very high right now because of the 6 week drought. I sent a few messages this week via my phone that did not show up on the blog. Here are a couple of those messages. Skip, Tom, Jason, and myself out on a beautiful Sunday evening making early preparations for the two day senior championship. Not enough time tomorrow with 7:30 tee times to get everything accomplished for our members and guests playing in this event so a little dry, evening mowing. Our greens continue to improve each day and the bentgrass seed that we placed on #3 green last Friday has now emerged from some of the rescue tine holes. 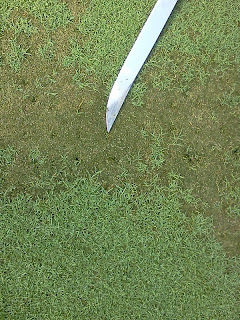 These seedlings in combination of the continued regrowth from the weakened bentgrass that is reviving will help to discourage the amount of poa annua that will attempt to invade these areas. We will begin to do some plugging over the next few days to continue with the repair. The staff also made a couple of more collar repairs as the continue the trend of normal to less than normal temperatures. Seedlings emerging at the tip of the knife. 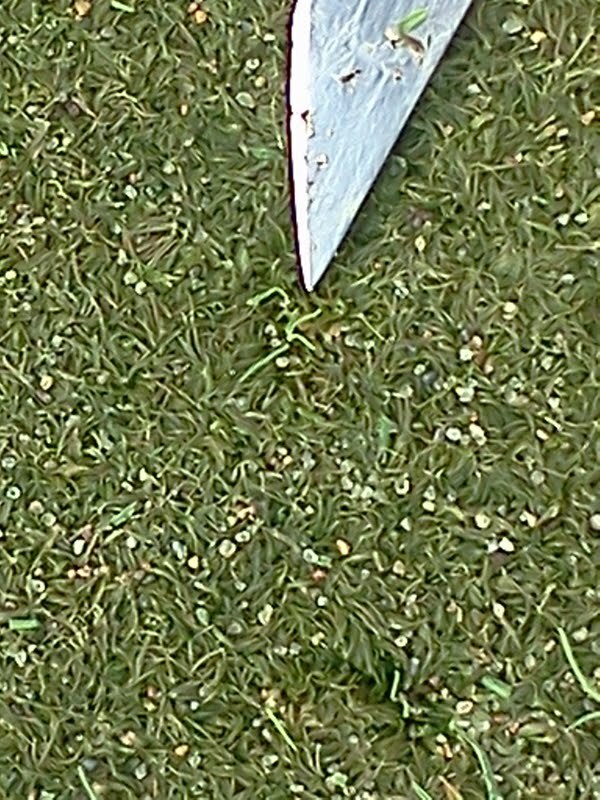 Same picture but a close up of the little squiggly bentgrass seedlings at the tip of the blade. The past couple of days our staff we completed the tees that we had promised. #13 white tee and #11 red tee. We also made a turf change on the #1 blue tee and converted from bentgrass back to zoysia which is the preferred choice of tee grass here at Glen Echo because of its low inputs(reduced water, chemical and fertilizer). It has great wear tolerance and can now be mowed by our riding unit which now will be mowing all tees on property. We've made changes to five teeing grounds this season; two from the blue tees, one from the white tee and two from the red tees and the walk path to #1 red tee as well. They will finish growing in the rest of the season but should be able to be used in the next few weeks. They will be in perfect condition for next season's play. Sod cutter was used to strip off the sod that was then removed by our staff from the first tee, the red tee on #11 and what is now the white tee from #13. The removal of the sod allows the soil that was hauled in to adhere to the soil and allows the sod that is laid to blend into the existing sod surrounding the tee. Stripped off sod from the red tee #11 waiting to be tractor rototilled by our laser leveling contractor from Schaefer Meyer. 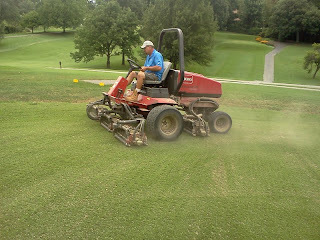 Mike McNeil laser leveling the #11 red tee. Laser leveling the white tee from #13. 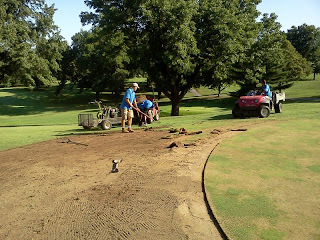 Once the tee is prepped, we fertilize it with a starter fertilizer to give the root system a jump start and the staff laying the big rolled sod. Skip, Russ, Tom L, Jason and Demarcus. The finished tee on #1. We will roll it tomorrow with the tennis court roller and let it grow for a few weeks before we open it back up. It will be topdressed with sand and will be walk mowed until it firms up enough for the riding unit to mow it. #13 white tee now aligned down the center of the fairway. 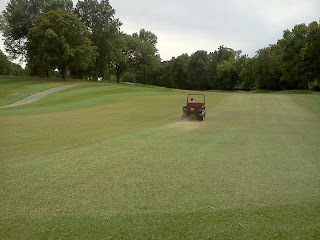 Our fairway aeration was completed on Monday. A good soaking rain wiould go a long way in helping with recovery. The front 7, plus 17/18 look good from last week's work. Laser leveling of the new white tee #13, renovated red tee on # 11 and leveling and regrassing of the #1 blue tee to zoysia will take place over the next couple of days. The steps were removed from the red tee on #1 a few years ago and were not replaced. We've had requests on a number of occasions to make some improvement to this area because of the steep incline down to the tee. I had intended to get something completed last year but did not get this accomplished. Today, we made the improvements which I believe will be helpful for those members who utilize this tee. We filled the incline with soil which has drastically reduced the severity of the slope. It will take a few weeks for the soil to settle and sod to become knitted down but I think this will solve the problem a number of our members have been having with the first tee. Walk path for #1 red tee and the sod being laid. The weather of the last few days has been a welcomed relief for our greens. What once appeared to be turf that was beyond recovery has now led to little small green leaves beginning to emerge from weakened and damage spots all over the course. We placed a granular fertilizer on the greens this morning to encourage and assist with the recovery. 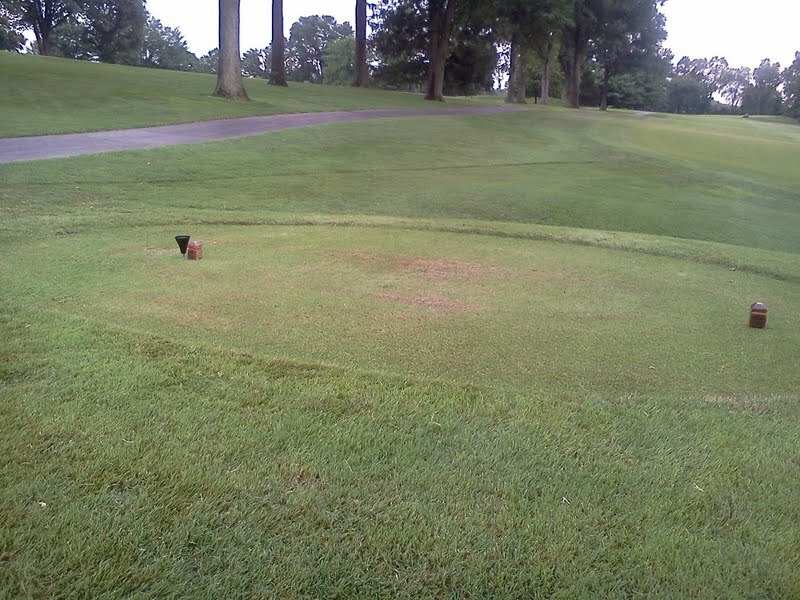 Years ago, false fronts consisting of bentgrass were placed on the approaches of our greens. This was a trend that many private courses in the St. Louis area implemented. Over the years, some of these areas have been reduced by the staff here at Glen Echo. 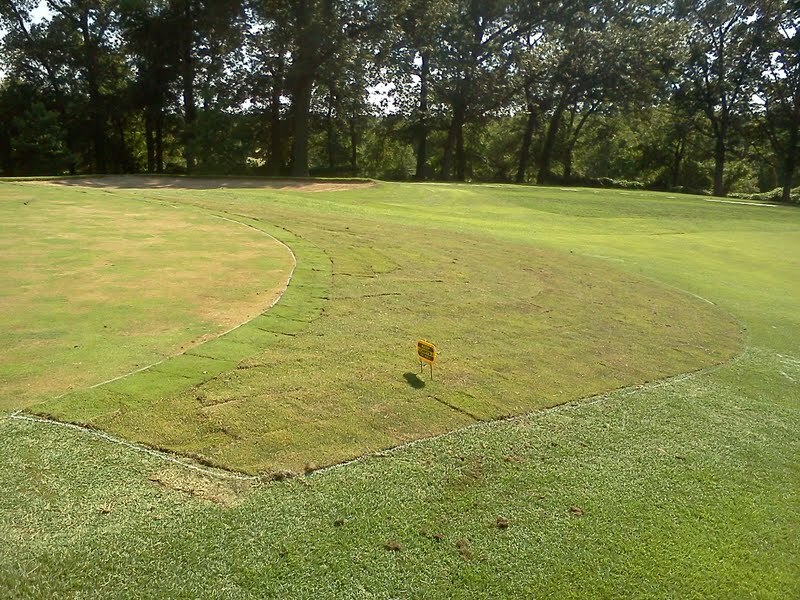 The USGA has recommended during their site visits that these expanded bentgrass approaches be eliminated. We experienced some significant damage to the collar/approach on #3 over the past few weeks. In an effort to make repairs to #3 collar as well as to the practice green, we reduced the size of #11 bentgrass approach and replaced it with zoysia. We also eliminated in total the bentgrass approach of #3. 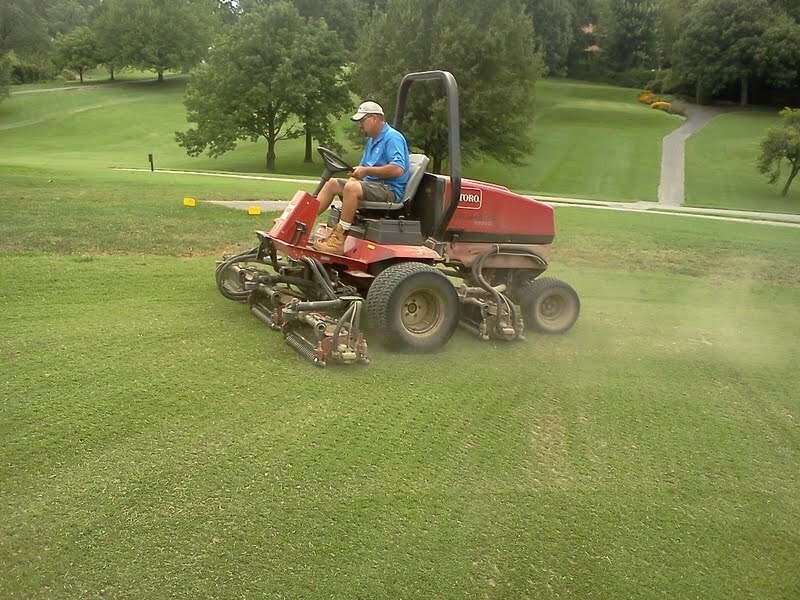 There are a number of reasons why we are eliminating the bentgrass approaches. The bentgrass on the approaches must be treated with chemicals along with the greens on a regular basis. The bentgrass approaches have to be walk mowed which takes more time for our staff. Zoysia grass approaches would be mowed with a riding unit. Additional water required by bentgrass making the approach soft and not allowing a ball to release. 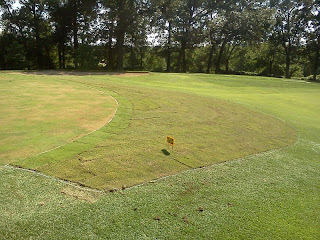 The removal of the sod including the damaged area on the front collar/approach of #3. The finished product on #11 4-5 strips of zoysia sod replacing the bentgrass. #3 approach and new collar sod added. We completed fairways 1-5, and 7 on Monday and did holes 17-18 yesterday morning. We plan to complete the remaining fairways on Monday. Core aerating using a 5/8" tine. Ground the cores with a flail mower which turned a majority of the material into powder. Drove a cart with a drag mat over the remaining soil, cores and grass tufts to assist in moving the material down into the profile. Used a blower to remove the remnants off of the fairways. This process takes between 2-3 hours depending upon the size of the fairway. 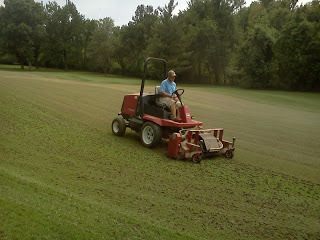 Jason using the flail mower to grind up the cores. Tom dragging the remnants to move the soil into the profile and possibly break up some additional cores. You can see the cleaner path created by the blower removing the material off of the fairways. Harry, beginning to mow #7 fairway. Still a dusty operation. 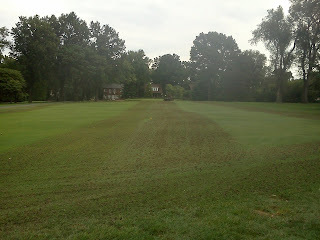 Our fairway core aeration began this morning. The staff will work as long as there is daylight and it does not rain. We are going after our largest fairways first to cover as much area as possoble. With the exception of #3, I do not believe we have taken any further steps backwards over the last couple of days and we continue to move in a positive direction with a few of our greens that were showing some serious stress. No doubt there still is some ugly grass out there right now but the weather this week should begin to put us back on the right track for recovery. We should begin to get a good idea this week which weakened or damaged turf spots will regenerate and or the the spots that will need to be restored by either inserting plugs or doing some additional seeding into the profile which would encourage more bentgrass over poa annua. I expect that a majority of our turf will regenerate from the crowns and will recover. We will begin to place some sand on the greens with our light topdressing program which will help to improve ball roll and will begin to protect the crowns of the plant that have not had any sand for well over a month. This will also help us as we begin to lower our heights over the next few weeks. Our weaker greens will probably not have any sand placed on them for another week to reduce the risk of the blades being injured from the abrasiveness of the sand. We will be removing some of our damaged collar sod in the next few weeks and replace it. Even with the severe conditions we have experienced, it is disappointing to me that we lost some of the turf that we did. As we do each season, we will evaluate our areas that need improvement, the parts of the program that worked and figure out if we could have done anything to offset some of the conditions that mother nature threw at us this season. We cannot be over aggressive with our turf recovery work because there is still opportunities for some significant heat that could take out any gains. With our Senior Club Championship in progress, Club Championship, and St. Louis District Senior Championship approaching during the last weekend of August and through the week leading up to Labor Day weekend, we on focused on getting our turf back to normal as quickly as possible. Of course rain would be predicted on our aeration starting day. We plan to start our fairway coring tomorrow. Our process will include pulling the cores, grinding the cores, blowing off the remnants and mowing the fairway. We will do as many holes as the rain allows us to do tomorrow and will finish up our task next Monday. Additional postings will be made during our process. We've received less than a tenth of an inch of rain since yesterday. Greens are beginning to grow and show some better color from the changes in the weather. All greens were mowed this morning. The core aeration of our zoysia tees last week placed some stress to our zoysia tees, especially since it stayed in the 100 degree range. 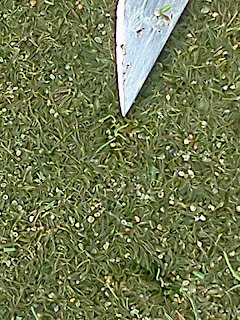 Opening the tee canopy and dragging the tees does add stress and will dry out the surfaces which did occur on isolated tees. Our tees have good irrigation coverage but stress will show up on some tees that do not have adequate water coverage. A few of the forward red tees only receive water from rough and our fairway coverage heads which at times are not spaced properly to get the proper water to relieve stress. We've increased the watering totals over the last few days and the tees are beginning to show some relief from the stress they have experienced. Cooler weather and rain will get the tees back to normal in the next few days. Our cool season tees continue to react negatively to the hot and dry weather of the last few weeks. They should respond in a positive way to changes in weather as well. Red tees of #2 showing some stress from aeration and drought stress. 4th warmest July on record. Shaping up to be a very warm summer period. Our average for days over 90 for April-July is 17. So far we have had 43 days over 90. The average for August is 7.8 which we might top by the end of the weekend. I'm sweating just typing this information. Our greens continue to struggle over the last couple of days. Our most troubled greens include 3, 2, 11, with 12, 6, 5 and 8 in order from the most severe to the least. Our other greens have their issues but are holding on for the most part. 2 appears to be improving but also is showing some weakness with some sections of bentgrass. 11 has continued to improve but has some weakness in general. 12 is showing some stress but has slowed in its loss of turf and is beginning to grow. Greens 5, 6 and 8 are showing some symptoms of turf loss like our worst greens but are still in better shape and are being monitored closely. Most of our worst greens are up against the edge of the property line where air movement is blocked by trees or houses which allows the heat to build as the day goes by.